Sony announced the Xperia S back at CES while the Xperia P and Xperia U were just announced at MWC. Sadly all three are packing Android 2.3 Gingerbread but are slated for an upgrade to Ice Cream Sandwich later this year (Q2 2012). The S is clearly aimed at the high end market, while the P is for midrange and U for slightly "lower end". 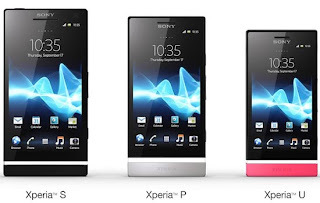 The Xperia S is equipped with a 4.3-inch 1280x720 720p HD display featuring Bravia Engine, 1.5GHz Dual Core Qualcomm Snapdragon Processor and a 12.1MP camera. The Xperia P is equipped with a 4-inch 960x540 qHD display feature "WhiteMagic" technology and Bravia Engine, 1GHz ST-E U8500 Dual Core Processor and a 8MP camera. The Xperia U is equipped with a 3.5-inch 854x480 WXVGA display, 1GHz Dual-Core Snapdragon and a 5MP camera. Knowing Rogers and TELUS' history with Sony Ericsson (now Sony) we would hedge bets that the Xperia S would head to Rogers while the Xperia P or U could be headed to TELUS or maybe even Fido as a value brand alternative. In any case we fully expect the new NXT line of Sony Xperia phones to hit Canada in the near future.